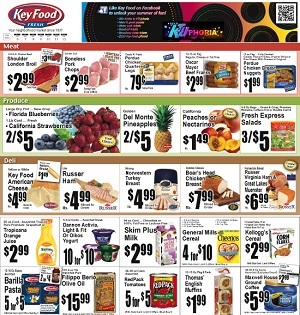 This week Key Food weekly ad circulars, coupons and sale specials. You can always count on Key Food for great savings & promotions on fresh produce, meats, dairy products, essential home goods, beauty products and more. Find the latest circular specials on: Stroehmann Dutch Country Bread; Thomas’ English Muffins; Deer Park Spring Water; Maxwell House Ground Coffee; Skim Plus Milk; Tropicana Orange Juice; Farina Mills Hot Wheat Cereal; Del Monte Tomatoes; Hunt’s Pasta Sauce; RedPack Tomatoes; Era Liquid Detergent; Mott’s Applesauce; Axelrod Cottage Cheese; Dannon Activia, Light & Fit or Oikos Yogurt; Eggland’s Best X-Large Eggs; Country Crock Mashed Potatoes; Great Lakes Mozzarella; Hebrew National Bologna; President Crumbled Feta Cheese; Ben & Jerry’s Ice Cream; Birds Eye Vegetables; Blue Bunny Ice Cream or Friendly’s Ice Cream; Key Food Sherbet; Crest Toothpaste; Gillette Shave Cream; Duncan Hines Classic Cakes; Filippo Berio Olive Oil; Boneless Pork Chops; Bottom Round Roast; Harvestland Whole Chicken; Oscar Mayer Beef Franks; Park’s Sausage Roll; Shoulder London Broil; Wholey Tilapia Fillets; Success Jasmine Rice; Green Giant Idaho Potatoes; La Rouge Peppers; Peaches or Nectarines; Sweet Potatoes; Hampton Farms Roasted Peanuts; Keebler Simply Made Cookies; Nabisco Premium Crackers; Wise Potato Chips; Skinny Cow Ice Cream Novelties; Banquet Select Recipes; and more. Key Food stores activate their latest weekly circular every Friday. On April 20, 1937, Key Food Stores Co-operative, Inc. was formed in Brooklyn and has since grown to over 145 supermarkets spanning all five boroughs, Long Island, upstate New York, New Jersey and Pennsylvania. Times have changed but the values that Key Food was founded on have not. All stores are still individually owned and operated, allowing them to meet the diverse needs of each neighborhood.